Every window in HGSI works with portfolio filters to limit or restrict the data presented. 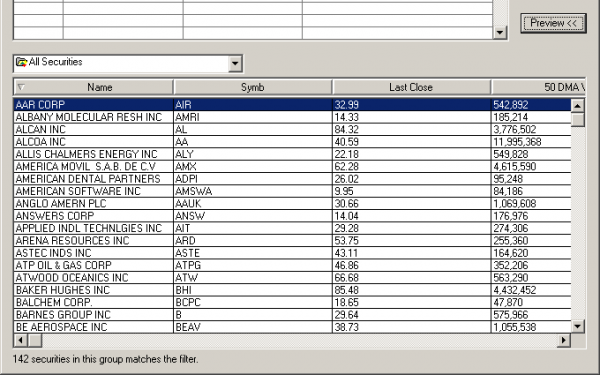 This allows you to quickly narrow down lists of stocks and separate interesting securities. 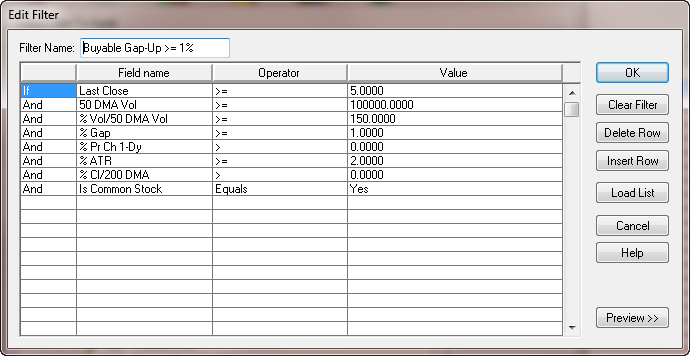 Each portfolio filter is composed of a set of rules with each rule being based on a choice of data field and a value. This very simple filtering language permits a wide range of complex filters. While authoring a portfolio filter you can use the preview button to see how that filter performs, so that it’s easy to adjust the filter in real-time. For a list of data fields available in the filters, see the section on the database. Every field in the database is available as a filter field. The new features using search in the Designer and adding filters to the Warehouse views are great! I hope everyone appreciates how much this and all the VPA work you have done has elevated HGSI. I have already gotten rid of 2 other programs that I was using, and my confusion level has decreased. HGSI allows for an ingenious method of screening stocks to meet fundamental and/or technical criteria, allowing you to create a watchlist of stocks waiting to be bought once your “trigger conditions” are met. What used to take hours or days of searching/winnowing is reduced to minutes. HGSI provides an independent way to find which areas, industries and then individual stocks are moving on a daily basis…the best stocks within a “hot” industry offer a better investment opportunity than just picking and choosing individual stocks.